This is my IRO Mark V in an image I took of it 5 years ago. Something about the image, perhaps the way that it is resting on the fountain, is reminiscent of a family vacation photo. Or the photograph of one’s child playing in the park. It feels very human, and that’s precisely how I feel about it. I’ve been riding this bike daily for years. Looking at this is like looking at a high school yearbook photo of someone who is still your friend. The spoke card in the rear wheel is from an alleycat that I raced in Florida. The Key to Cortez race (which, oddly, there’s a map of here) was my first. My brother was living in Sarasota at the time and planned the route for the two of us. We placed 8th. Well, 8th and 9th if you want to get technical, but let’s just say we tied at 8th. I felt like I was cheating because I’d been riding in San Francisco. Training in SF and then racing in Sarasota is like weight-training on earth for a Strongman competition on the moon. Also note the white bar tape in this photo. What an awful idea. Stays white for about 2 hours, unless you wash your hands before riding your bike. My Mark V has been through a lot. When I worked in Menlo Park, I commuted to and from Caltrain on this thing. When I lived in Daly City, I climbed 18th Avenue countless times for band practice. It was a trek that was literally uphill both ways. 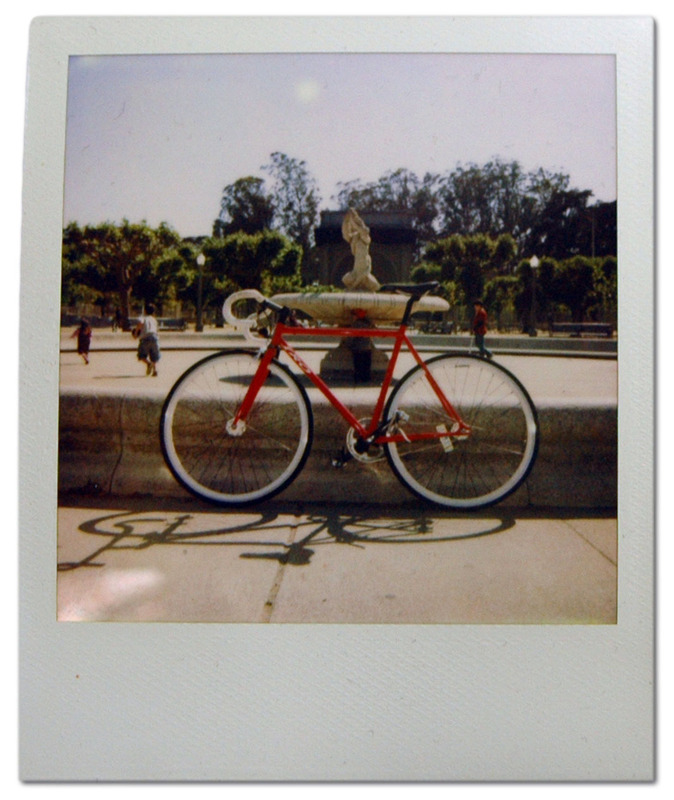 If I could find some Polaroid film, I’d love to go back to this fountain and lean my bike against it again for a coming-of-age photo. The paint has now suffered countless knicks from being locked to various things in the city. The bars have been flipped and chopped to become bullhorns. The chain is black, the wheels are dirty, and the rear tire is white and worn nearly-through. My Mark V is like a hammer with a wooden grip that has worn grooves from the carpenter’s hand. Someone once tried to steal the seat with an Allen wrench that was a bit too small. In the process, they stripped the bolt into a smooth circle. Now impossible to adjust by traditional means, my bike is locked into a perfect fit with my body. And I wouldn’t have it any other way.